In a smart and funny new novel by the author of Small Admissions, a family’s move to New York City brings surprises and humor as their lives merge with the captivating world of Broadway. I was a huge fan of Small Admissions, so when I saw Poeppel had another novel coming out, I was very excited. Limelight was entertaining and fun from start to finish and Poeppel's writing style did not disappoint. Poepple's characters were smart, fresh, and genuinely made me want to a part of their family. The story line was a lot of fun and kept me turning pages late into the night. The main character Allison is by far my favorite part of the novel. She is a wonderful mom who puts her kids first and she even transfers her mom skills to kids who aren't her own. She was smart, funny, tough, and didn't take crap from anyone. I loved her personality and I think she really made the book for me. There were so many great characters in this novel, so I can't comment on all of them, but I thoroughly enjoyed getting to know each character. 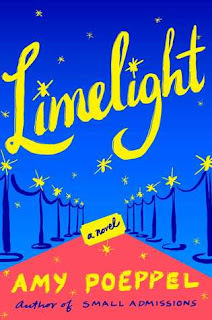 Limelight is a fun and entertaining novel and I would highly recommend it to readers who enjoyed Poeppel's earlier Small Admissions. Her light and fresh writing style is even better in Limelight! I loved the small glimpse into the Broadway life, and I look forward to more novels from Poeppel in the future. Thank you Atria and NetGalley for sending this novel in exchange for an honest review.